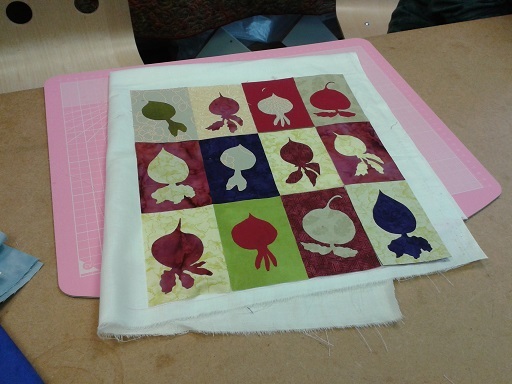 Remember when I posted about the Festival of Quilts and Gillian Travis’s prize-winning Nordic Jumpers Quilt and said I would love to go on one of her courses but they were usually in term time? Well I found one that wasn’t and had the very best kind of day in a beautiful quilt shop, The Quilt Cabin in Hebden Bridge with Gillian and a small group of other textile enthusiasts. 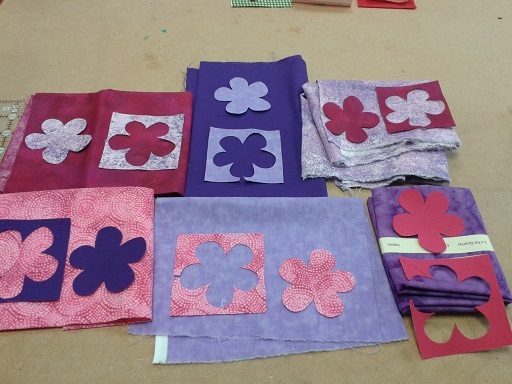 The course was called, ‘ Take a Simple Shape’, and was based on the idea of, ‘counterchange’, using one or two simple shapes, cutting them out of fabric and swapping the cut pieces to create different combinations of colour. We started with Gillian showing us some of her work which is amazing, I lost count of the number of times I said, ‘wow’. The shapes she uses are not complex but the use of colour and machine stitching and in some cases printing combines to give stunning effects. 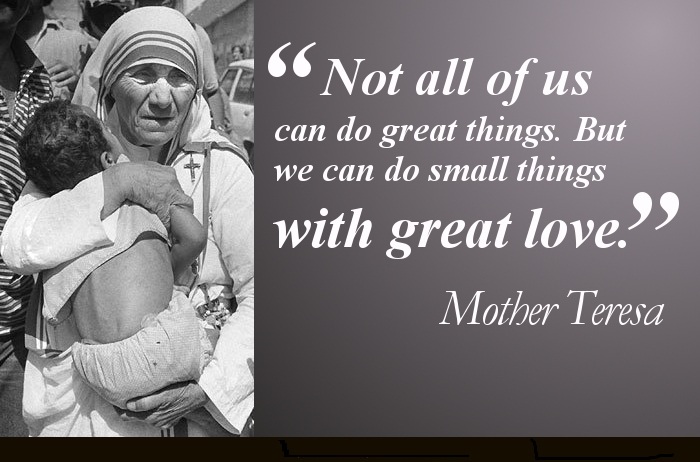 Go and look at her blog for more of the stunning inspiration. 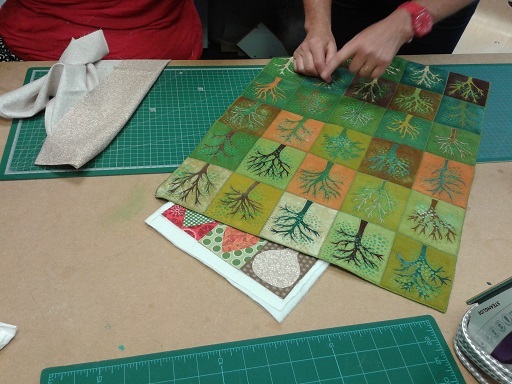 This is one of her recent pieces, beautiful trees with outline stitching and printing using a stencil over each tree. 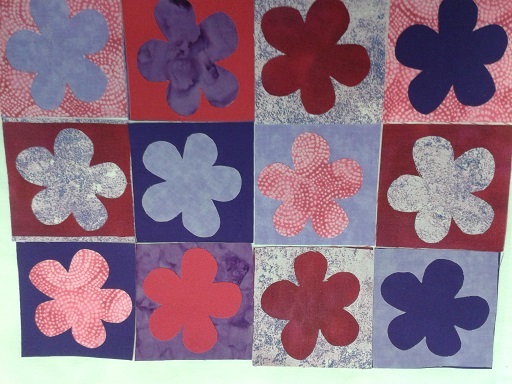 My inspiration was all my lovely flowery Liberty fabric, I wanted to make a wall hanging for the craft room. 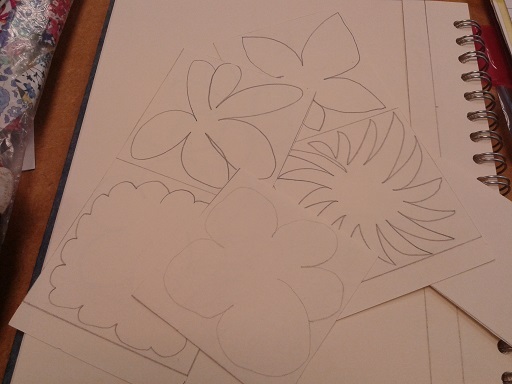 I started with drawing different types of flowers until I decided on the shape I liked best. 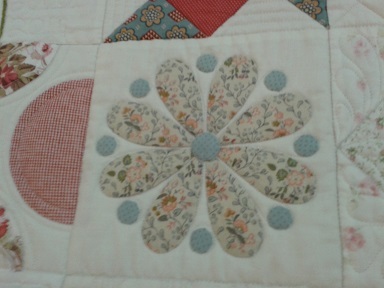 I want to use some of my flower buttons to embellish the finished product so thought this shape would work well. 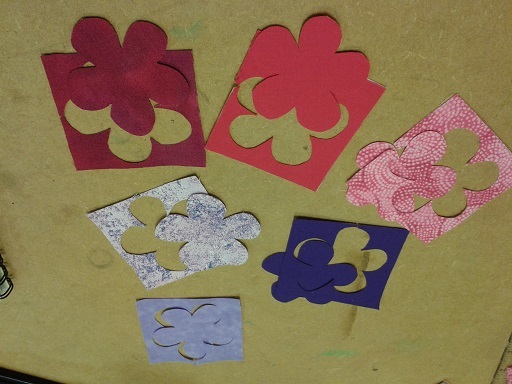 The next step is to trace the flower onto fusible web and put onto fabric then you cut it out carefully so that you have a shape and the border to use. 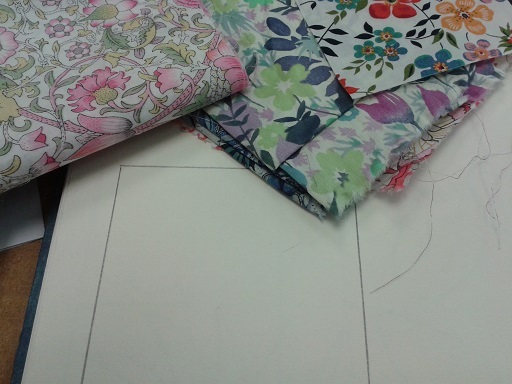 The clever bit is putting it onto different background fabrics doing a little mix and match until you are happy and can fuse everything together. Apologies for the upside down picture above – have misplaced my camera 😦 so am back to phone with limited editing! 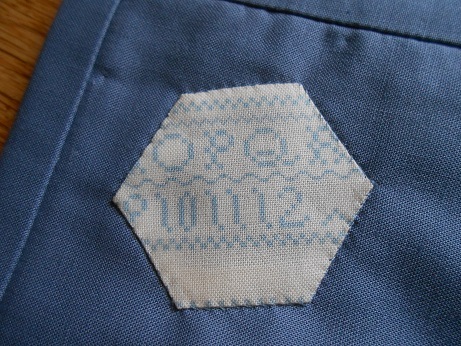 You then add your backing and wadding and zig zag between the squares before embellishing and binding. Mine is at this stage at the moment, I have chosen the buttons but need to do some more machine stitching to secure the flowers and some hand stitching as well, have just taken delivery of the most gorgeous Cottage Garden hand dyed variegated thread from this site so will be using some of that. 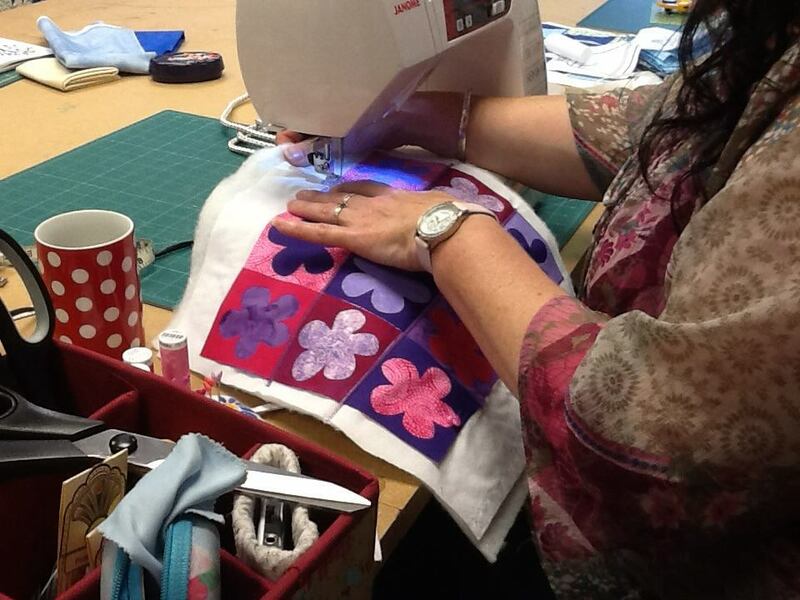 Here I am stitching at the workshop – action shot by Elaine from the quilt shop. Looking forward to using my new machine for finishing this project, it has made such a difference having a good machine to work with, I finished the toile of the wedding jacket in 2 and a half hours with no problems with tension or jamming, it was a really pleasurable experience. We are off to Lincoln Bishop’s Palace this weekend to do our last show with our group, hopefully there will be lots of sunshine and happy visitors! Hope that you have a lovely weekend as well, take care and thanks for visiting. Hello, hope that you are all having a nice week, I have been busy stitching away at my hexi pincushions and needlebooks, in between some sorting out of the craft room. 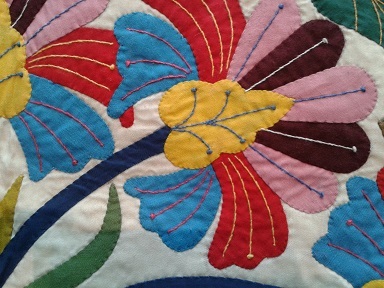 One of the many quilting blogs that I like reading is called, ‘In Color Order’ , run by Jeni Baker who regularly contributes to quilt magazines that I read. 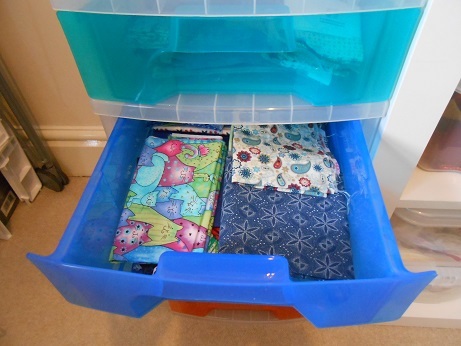 I have long admired those quilters who have their stash organised by colour as mine was piled in a few boxes which meant getting everything out if I wanted to find something for a specific project. 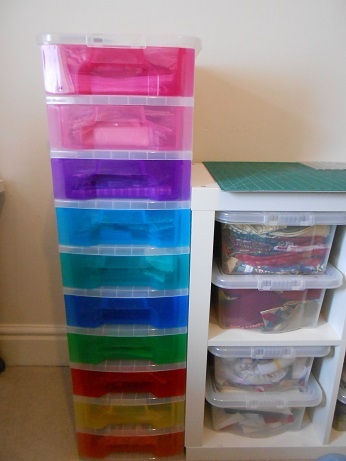 Amanda Jean at Crazy Mom even has her scraps sorted by colour – go and have a look at this storage bucket tutorial for details of how to make the cutest scrap buckets! Not any more! 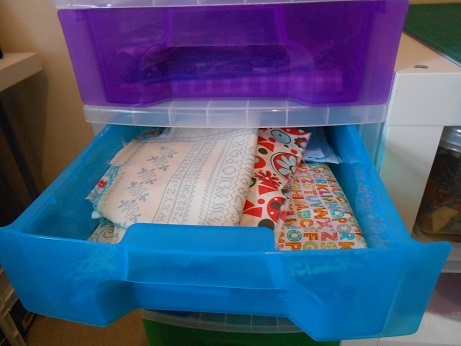 My lovely friend Sharon has been doing a bit of sorting in her own craft room, when we went round a couple of months ago to help her with a stash sort I admired these drawers and said if she ever wanted to get rid of them I would buy them off her, (she had two sets so still has some herself). I also got the chance to declutter this area, this old shelving unit is very rickety and was just getting used as a dumping ground so things have been made much neater by its removal and it will now have a new home in the shed. I can see exactly what I have got in the pinks, blues, turquoises etc. 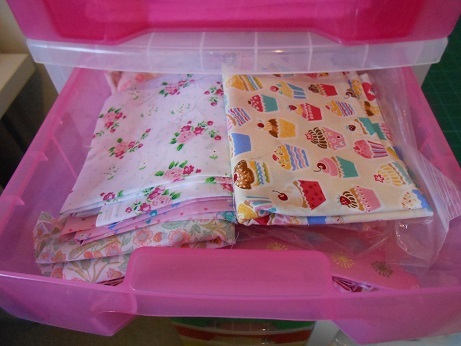 I had great fun sorting and found fabric I didn’t remember having! I also got chance to put up some new pictures and pin boards for my quilt blocks, thanks to our block of the month challenge I now have four of those – more to come as I am still behind, (given that it is the eighth month of the year ha ha), so will take some pictures of those once I have finished a few more. 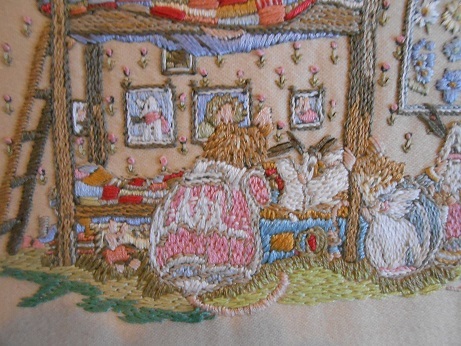 This very cute little embroidery was in one of our local charity shops so had to come home with me for the vintage embroidery wall. It was only 75p and the amount of work in it is amazing, look at the detail of the little mother mouse tucking up the children and the picture on the wall. 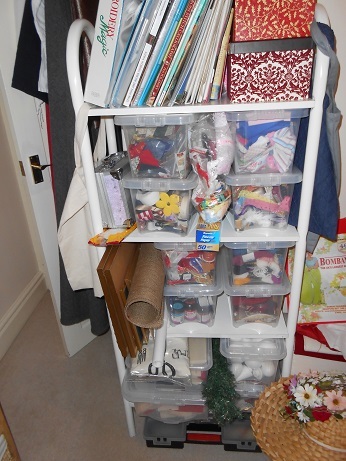 The other arrival for the craft room was very exciting – took a bit of getting out of the box! 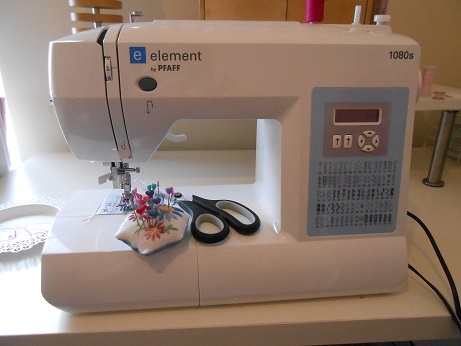 I was not really planning to buy myself a new machine at this point though was getting very frustrated with my 5-year-old Janome which just kept losing tension and jamming all the time. Had put it to one side for a service and got out the older spare machine but when using it this week for a small piece of finishing realised that the reason that I had retired it was because of the faint burning smell when you use it! 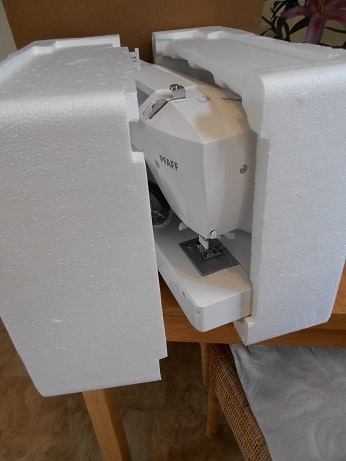 Was just doing a little browsing of new machines as you do and came across this little lovely, reduced and with free quilting accessories so treated myself to a very early Christmas present. 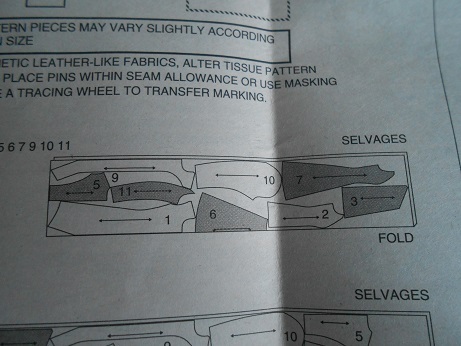 Well I do have the special sewing to do and it would be nice to spend more time actually sewing than sorting out a machine! 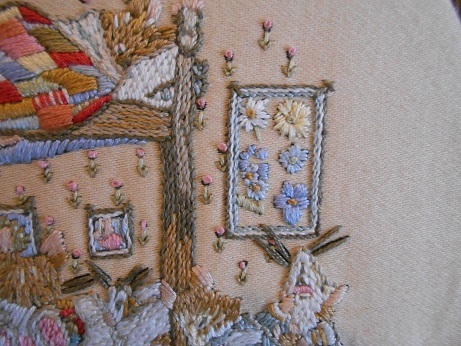 Looking forward to spending more time this weekend practising with all those lovely embroidery stitches. Hope that you have lots of nice things planned and thanks for visiting. Hello again, today I wanted to share the rest of the pictures from the Festival of Quilts, these are mainly the modern and art quilts. 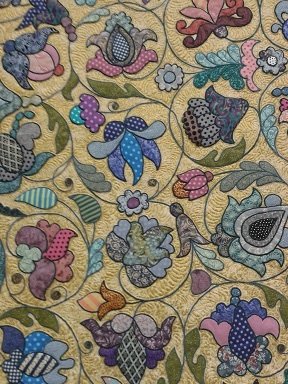 Unlike the traditional ones where the inspiration are blocks or wholecloth patterns that have been taken from lots of different published sources these really showcase the very wide and varied arts of quilting and the different inspirations that people use. 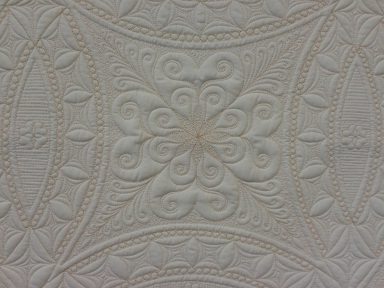 I love both types of quilting, I think traditional ones are my favourite just because I favour traditional things more but these examples below are stunning in their execution and really show some serious quilting skills as well as design skills. 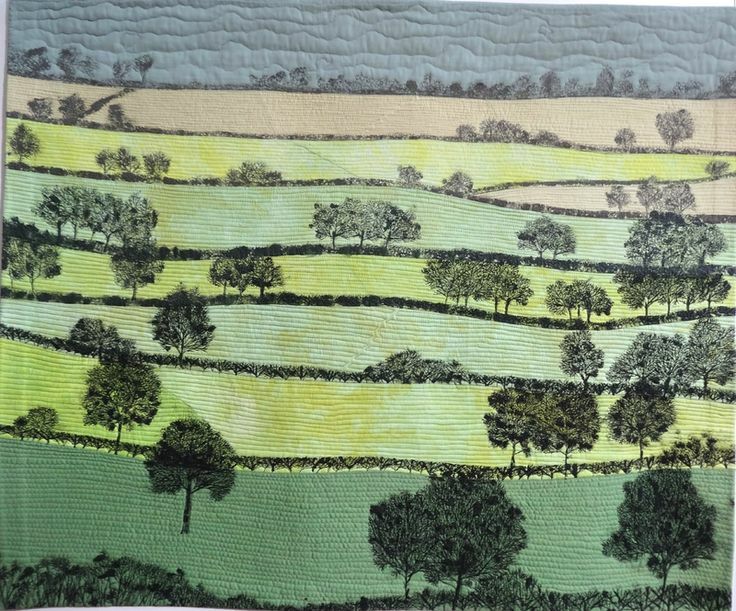 This first quilt is called, ‘Marshwood Vale’, by Kate Dowty and was one of the most popular on display. 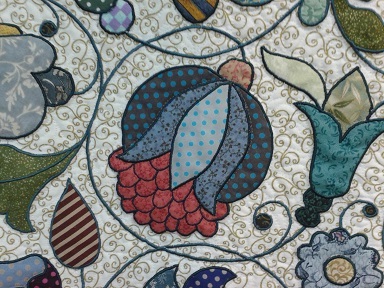 A really unusual quilt with amazing quilted trees on top of the fabric landscape. 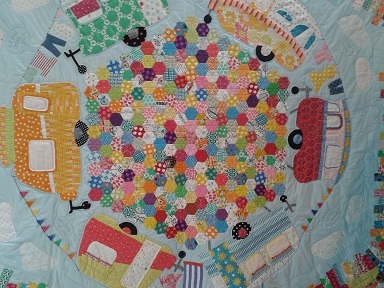 I think this one below was my personal favourite from the non-traditional quilts, this is , ‘Wish You Were Here’, by Tracy Aplin. 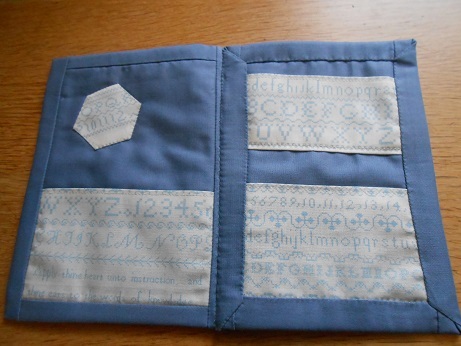 It still has some traditional elements like the hexi pieced centre and border but I love the quirky touches such as the appliqued sayings, (one of which is ‘it is Pimm’s o’clock?’ ), mini bunting and washing lines. You can’t see in my picture but each corner is finished with a little caravan as well, a really unusual edging. I have just found her Pinterest Boards and will be going back to them – so many pretty pictures and some of caravans! 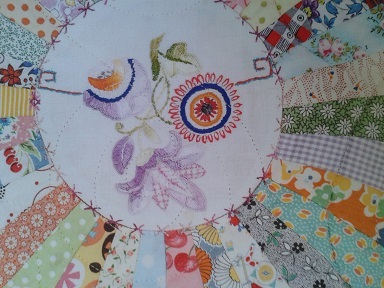 Especially this board her, ‘My Quilts’ , one – go and have a look at her, ‘Love of Liberty’ quilt – divine! 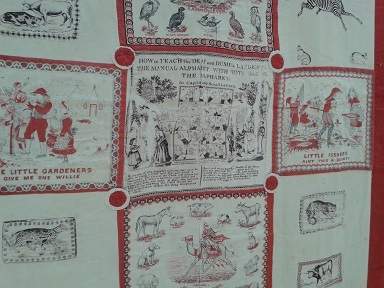 I love caravans, spent many very happy holidays in them as a child and am hoping to buy one myself when I retire and this quilt is a wonderful representation of that very British holiday! 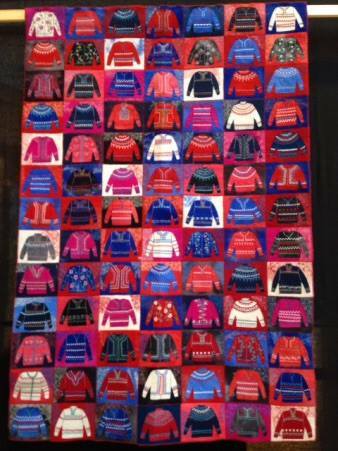 Sharon has been on few quilting courses and one of her tutors is Gillian Travis who won second prize with this very unusual machine embroidered wool quilt called, ‘Jumpers’. This is beautifully executed and very original. 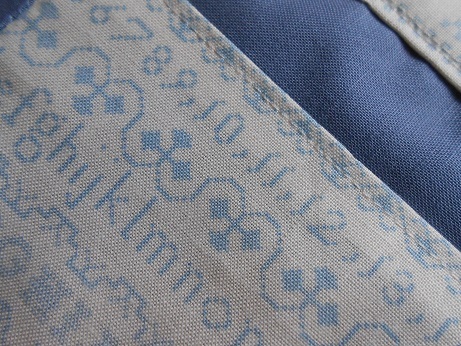 The lovely thing was that Gillian was wearing a shirt made from a print of a photo of the quilt as well. 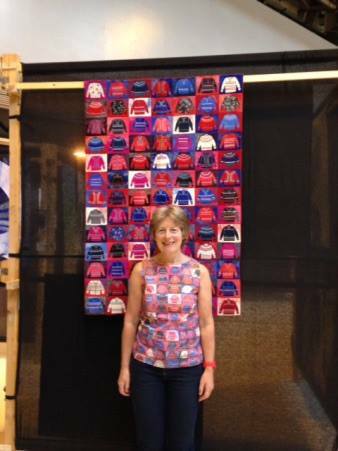 Here she is in that in this photo taken from the Facebook page of the Quilt Cabin in Hebden Bridge where she regularly teaches. Really wish that I could go on one of her courses but they are usually in term time. 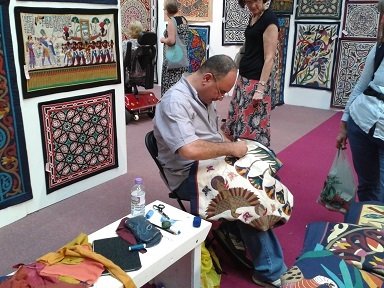 I was also very impressed by the Tent Makers of Cairo exhibition – not modern in the designs or the beautiful applique that makes up each pattern but in the sense of it being good to see men quilting. 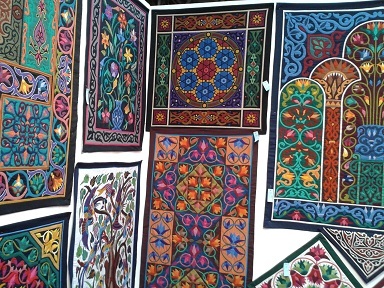 These wonderful quilts are based on the traditional embroidery done for the inners of tents and were really stunning. There were a few men at the show – Luke Haynes was exhibiting and we spotted Kaffe Fasset wandering about but the festival stats page shows that 97% of the visitors are women. 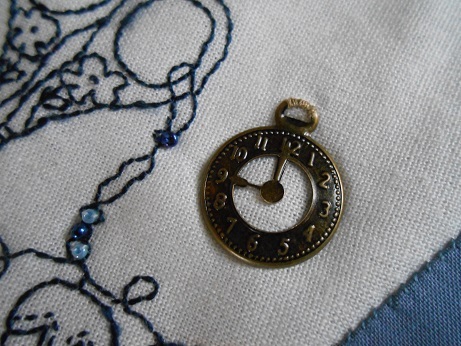 My stitching is going well, just adding beads and doing the finishing touches and then can reveal all. Am sorely tempted to keep this one for me but will see, really need to build up the pile of Xmas pressies and though I have lots of WIPs have very little finished. Of course if I spent less time blogging and reading blogs and Pinterest boards and going, ‘ooh how lovely’, I would get more done lol. My excuse is that my wrist is still a bit painful and needs rest. Are you like me, lots of projects on the go? Trouble is I keep seeing new stuff I want to do and thinking I have far more time than I really do. Apparently it is only 19 more Fridays until Christmas! 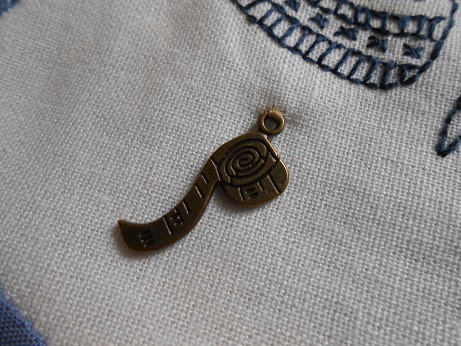 Take care, keep busy and thanks for visiting. ‘Than buy a bit of fabric or two… ‘, apologies to the Grease songwriters for my shameless adaptation of their classic sung by Rizzo, (one of my favourite characters from a movie ever, I so wanted to be that cool!). Anyway I did buy a little bit and some fantastic accessories for crafting and my spending this event really emphasised what I say to the children about supporting small businesses. I know that they think that is an excuse but in truth a large amount of my crafting money each year goes to small businesses set up by women like me who are crafting and selling whatever they create or source so as far as I am concerned I am supporting the sisterhood! 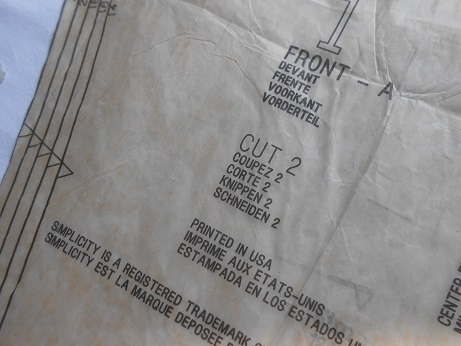 One of my best purchases was this set of papers from the lovely Jesse of the Messy Jesse blog. I would not have found this stall but for my friend Helen who was very excited that she had found her. Helen reads her blog and had met her in person for the first time that day and introduced me to the joys of lots and lots of pre-cut papers for all sorts of English Paper Piecing. Jesse has just set up this side of the business, Sew and Quilt , and it was a real delight to talk to her, about how this was all part of the maths topic of tessellation and technically to do with the angles at a point, while patchworking we are all actually applying rules about the interior angles of regular polygons don’t you know! 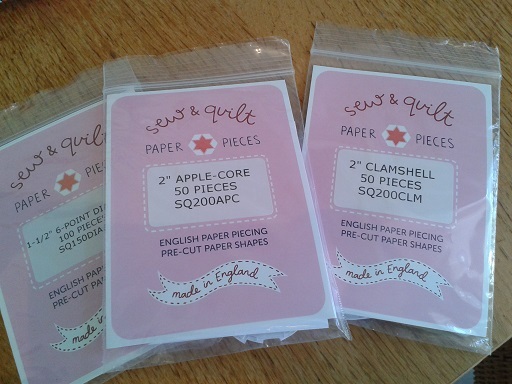 As well as some irregular ones like apple cores and clamshells, two patterns I have wanted to try for ages. 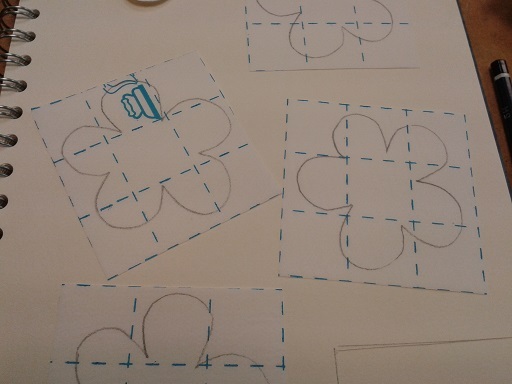 Having taught Maths for a long time I am always trying to find ways of getting people interested in it and have used quilts as examples before. 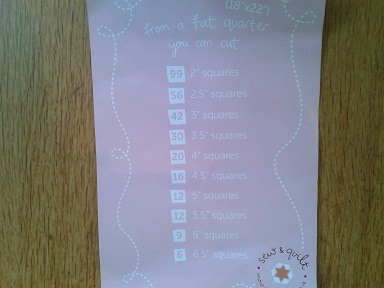 The back of her show leaflet was this really useful cutting guide which will go up on my craft room notice board. Another practical application of Maths. 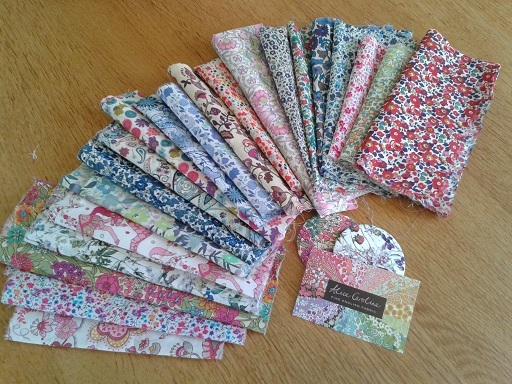 I also bought some more Liberty from Alice Caroline. Much as I am enjoying piecing the blocks for the Block of the Month Challenge my real passion is English Paper Piecing so with this lovely rainbow and the extra papers from Jesse I can patchwork to my heart’s content! She also had these cute handbag mirrors so I can see a few matching make up bags being made as presents. 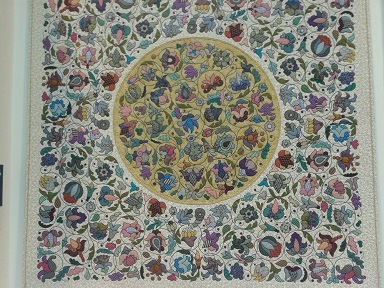 Isn’t this the prettiest business card ever? 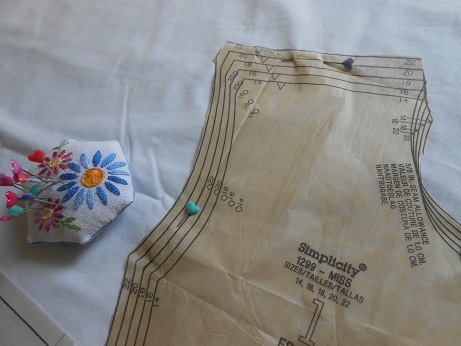 I find it so relaxing sitting watching TV and piecing, whereas using my machine always gets frustrating when the points don’t match. Will persevere as love the end results but will mix and match techniques. I love reading magazines for inspiration and have just changed my subscription as I like to vary them every couple of years. 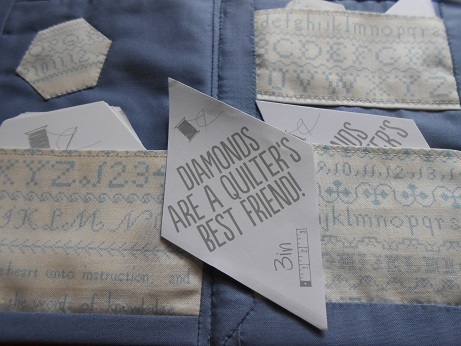 With the new Fabrications Quilting one I got this set of threads for free – how shiny! 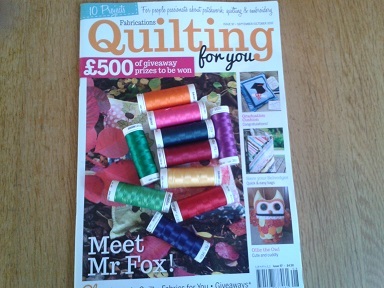 I had this magazine a few years ago and like the inclusion of embroidery projects as well. 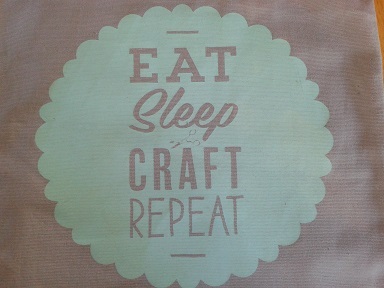 And another new one, Today’s Quilter , was giving away this tote bag as well as first 3 issues for £3 , this sums up my idea of a perfect weekend and I am seriously considering stitching this saying and framing it. 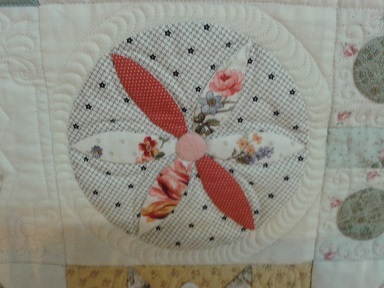 I also picked up a copy of Australian Homespun, I like this magazine and was especially loving this quilt design on the front cover, what a great idea for using my vintage embroideries. 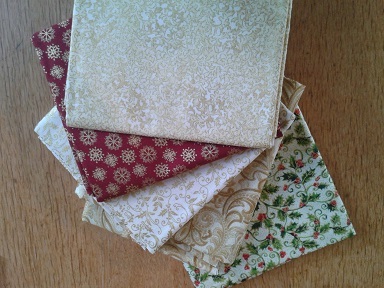 There was a little bit of Christmas fabric that snuck its way in as well from the lovely Sue at Springwood House Designs. She has a new design called Fun with Leaves, beautiful hand-made leaves which would look great in wreaths. 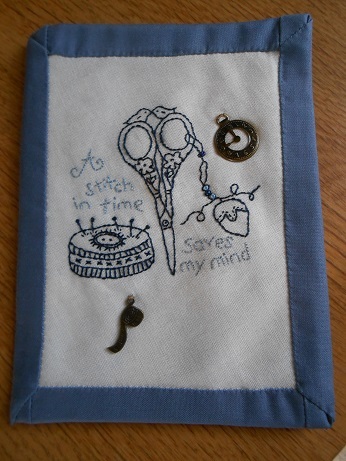 Am still working on the scissors stitching from Jenny of Elefantz – have enjoyed it so much that I have subscribed to her Stitchery Club, it has been a long time since I have done any stitching and just love her work. 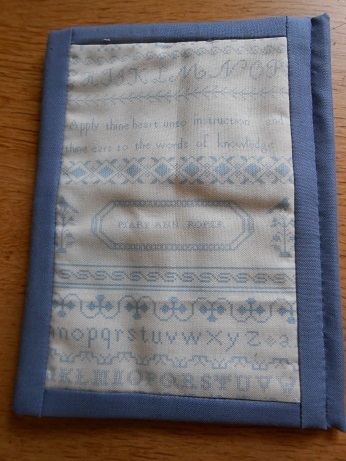 Would have had that completed but spent 4 hours on one quilt block over this weekend. 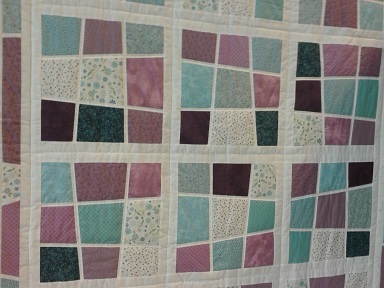 I am so slow at this and am in awe of people who can piece a quilt in a weekend. Right sadly the day job is calling so I had better go now. I love these summer mornings, I have been awake since 6.30 having a few cups of tea and bogging and it is so nice to have more time and feel like doing things, sunshine makes such a difference. Thanks for visiting and have a nice week. Hello everyone, hope that you have had a nice weekend. We have had a wonderful trip to this year’s Festival of Quilts, Sharon, Helen, Emily and I from knitting group enjoyed a very lovely girl’s day out, it was their first trip to this show and my second. 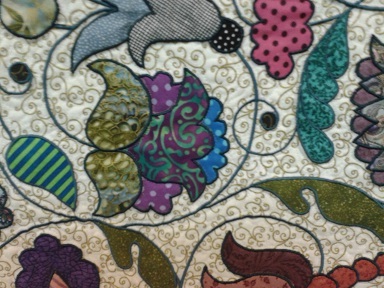 The quilts, as always, were amazing and I took so many pictures I have split them into two posts. 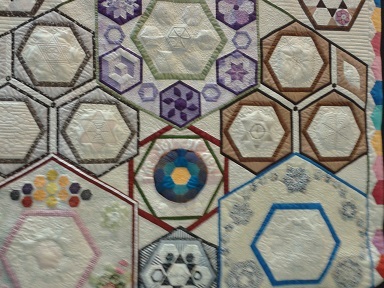 I love traditional quilts and there were some exceptional examples on show. 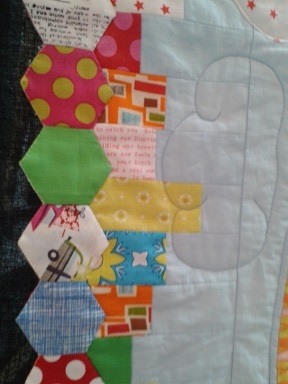 This was the first one that we saw when we went in and I love the unusual appliqued blocks. This is, ‘Stonefields’, by Coriene de Has and Kay Bell. 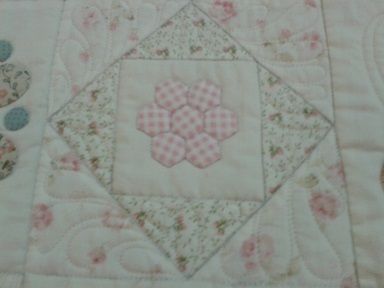 It has given me some ideas for other things to do with hexis – love this hexi in a square in a square idea. 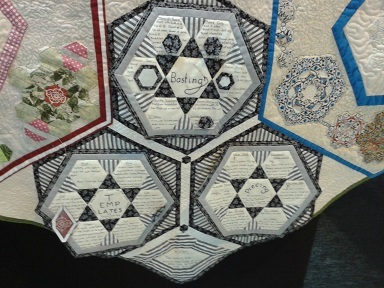 I also really liked this hexi quilt – called, ‘The Joy of Hex!’, by Penny Chattey. 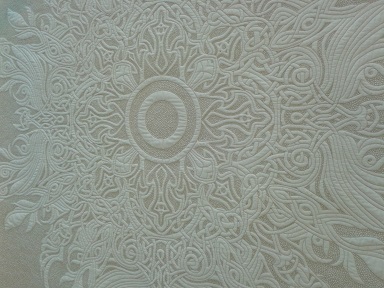 As well as some brilliant quilting there were three panels at the bottom explaining the technique. Some fabulous examples of wholecloth quilting as well, this first one by Ximo Navarro from Spain, entitled, ‘This is not a Dream, this quilt is real’. 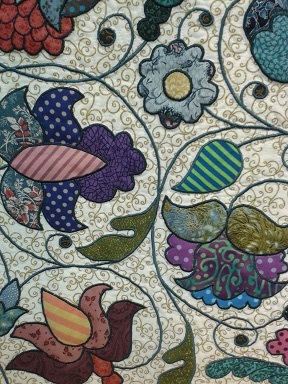 And this from Sandy Chandler, ‘Juno’, this is just the centre of a double bed sized quilt, a beautiful piece which must have taken hours to do. 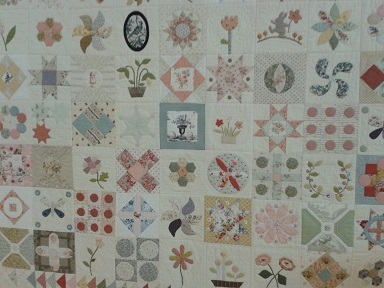 My favourite quilt in the whole show was this one by Liz Jones, ‘All Things Bright and Beautiful’. 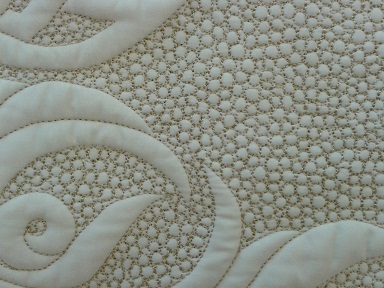 I love the combination of the Elizabethan style design with modern fabrics and the machine applique is perfect. 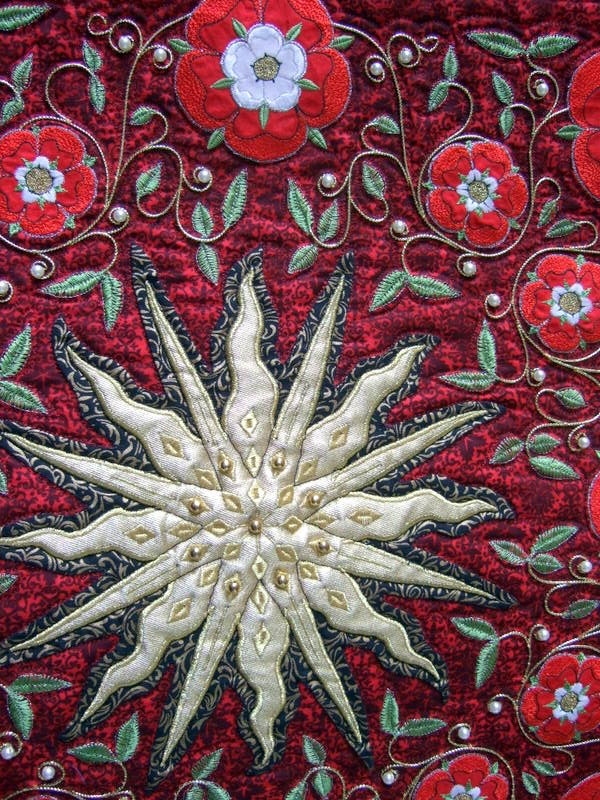 I have been looking at some of her other work, this is her Pinterest page where I found this earlier Tudor Rose quilt. 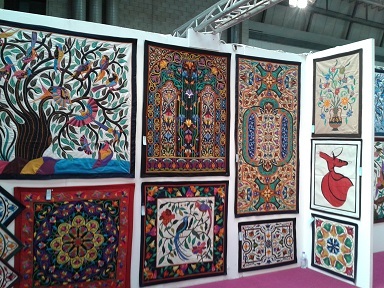 The other thing I like about quilt shows is the range of work as well, there are quilts from all levels of skills including some lovely quilts by children, including school groups. 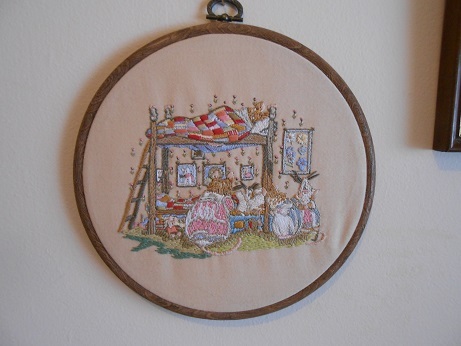 This one was really nice from the, ‘First Quilt Category’, ‘Everything she does is Magic’, by Lucy Currie. 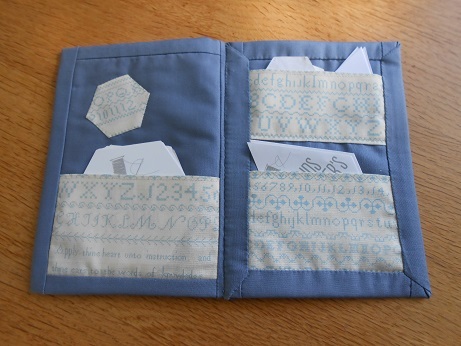 I really like the colours and the wonky Sudoku blog. 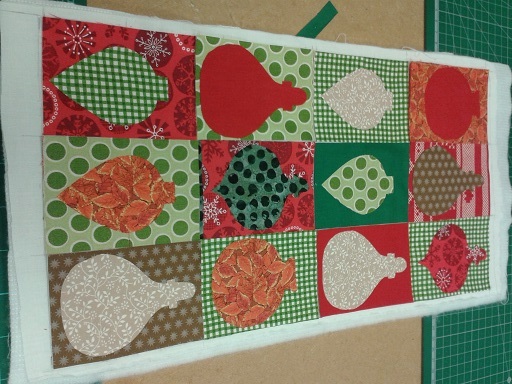 This looks like my level of quilting and is similar to the Stained Glass Window pattern I used some years ago for my Christmas throw and cushions. 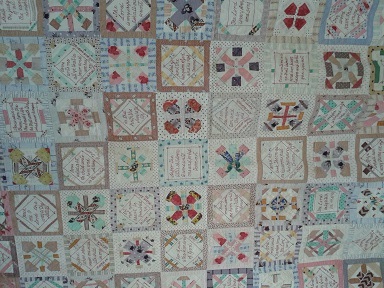 There were also some historic quilts from the Quilt Museum in York, a quilt pieced from printed handkerchiefs and a bible quotes quilt. There was also some retail therapy of course 😉 I had been reading some statistics about visitors from the Festival web site and it said that the average age of visitors was 57, (so we brought that down a bit as our average age is in the early forties), and the average spend was £197! 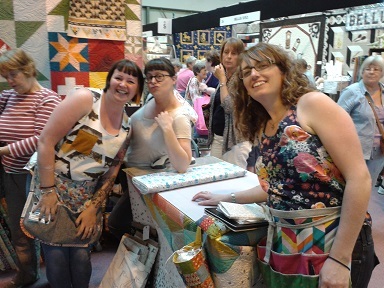 I am pleased to say that we were very restrained despite all the temptations and it was nowhere near that much.We did go and say hello to Lisa and Justine from our local quilt shop Simply Solids, here they are with Helen.